Lanka Property Web has done it again. Without stopping with its victory for the Best Website of Microsite in the Professional Services sector for 2016/2017, the Company continued its relentless drive for excellence, enabling them to win the Best Digital-Integrated Campaign award for 2017/2018 at the prestigious SLT Zero One Awards. This achievement is by no means an easy feat in this fast-moving digital era, where anyone with a smartphone can have a digital presence selling goods or services. This award demonstrates the dedication and focus the company has invested to become the top real estate service provider in the country. The SLT Zero One awards is devoted to recognising institutions, individuals and brands that harness technology to achieve great heights in their chosen sphere. With the myriad of opportunities available to everyone in this digital era, there is intense competition whereby a great campaign becomes essential. Lanka Property Web was founded by Daham Gunaratna in 2007, amidst much scepticism if a local property website could engage customers via a single digital platform. Without underestimating the capacity of people to embrace technology to fulfil their needs, the site has harnessed innovative technology and solutions to provide a service that added value, is efficient and effective. Lanka Property Web offers free and flexible digital platform to landlords, property owners, agents and buyers to advertise their properties for free and for prospective buyers to meet them online. 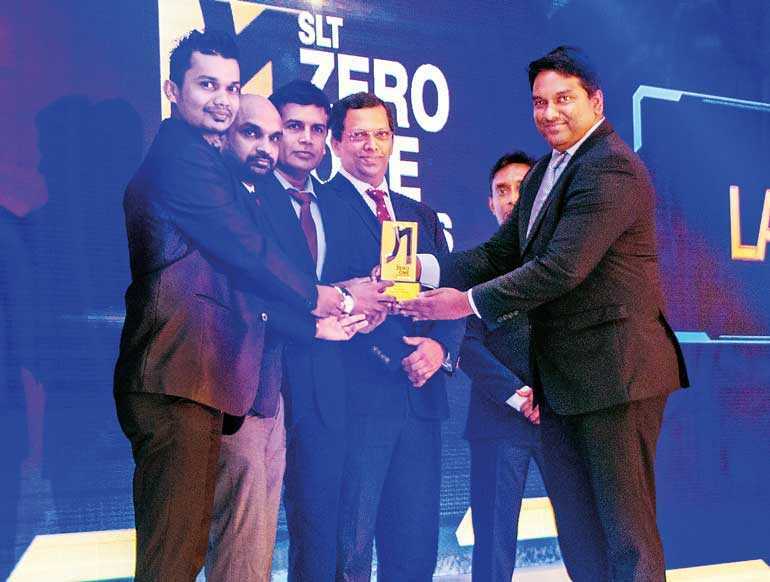 The SLT Zero One Awards identified the innovation, effective execution and outcomes which the website has delivered based on an effective marketing and communications campaign that engaged numerous stakeholders. Lanka Property Web tapped into all segments including non-newspaper readers, expatriates and foreign real estate investors, bringing them together with local partners; exclusively on a virtual platform. Lanka Property Web is the most visited real estate website in the country with the highest number of real estate advertisements from houses, apartments and land for rent, to properties for sale or lease. Its easy accessibility coupled with search engine optimisation has contributed to Lanka Property Web sustaining its reliability, also offering filters to narrow a search, plus, displays the country’s only House Price Index allowing better understanding of market fluctuations. Using digital marketing tools, the site offers enhanced and advanced user experience. By December 2017, the Company had achieved growth of 22% in the total number of visits compared to the previous year to 1.94 Million users with greater time spent on the site. This is also due to the enhanced and innovative features on the site with people deriving more benefit from its use. Over 61% of advertisements have generated leads, whilst 54% of advertises state they sold or rented their properties through Lanka Property Web. In the pipeline are plans of introducing a mortgage calculator, a chat facility which connects the buyer and seller real-time, and chatbots to take care of basic requests. Lanka Property Web recently acquired Lamudi.lk, Sri Lanka’s 2nd largest property portal to become the single largest property portal in the country.